After more than a year of hits and misses in the pool of emerging restaurants to go public, investors may soon be able to buy into a rapidly expanding gourmet burger chain. It's not In-N-Out. It's not Five Guys. However, don't underestimate the appeal of Shake Shack. The milkshake and burger chain that got its start as a modest kiosk in the heart of New York City's Madison Square Park 10 years ago is gearing up to go public, according to Reuters. Things are far enough along that JPMorgan and Morgan Stanley have reportedly already been brought on to serve as lead underwriters for the offering. Reuters is reporting that it's unlikely to be a big deal in terms of the number of shares offered. Shake Shack is expanding quickly, but it's still relatively small, with just a handful of locations worldwide. Given the market's interest in eatery IPOs lately, one couldn't blame Shake Shack for trying to strike while the iron skillet is hot. There are 26 Shake Shack locations in the country, half in its home state of New York. There are also another 19 overseas, with most in the Middle East. We don't have hard financials yet. That will come when Shake Shack formally files with the Securities & Exchange Commission to go public. Reuters reports that it's likely to post a profit of $20 million next year. At a time when McDonald's (MCD) is struggling -- gearing up to post its first year of negative comparable-store sales in more than a decade -- taking a burger chain public may not seem like a very smart idea. However, Shake Shack knows that some of the weakness at McDonald's is coming from consumers trading up to the gourmet burger places that offer higher-quality meals at higher prices. Shake Shack may not be alone. Reports earlier this year had Smashburger and Habit Grill -- two larger players in premium burgers that ranked well in Consumer Reports' taste tests earlier this year -- also exploring IPOs. Some can also argue that there are already gourmet burger chains trading publicly. Red Robin Gourmet Burgers (RRGB) has been trading since 2002, two years before Danny Meyer opened the original Shake Shack stand. However, Red Robin is a casual-dining concept with table service. Shake Shack, Smashburger, In-N-Out and Five Guys all follow the counter-ordering model that McDonald's has been feasting on for generations. Can Shake Shack Shake Things Up? Shake Shack is small, but it's popular with a rabid fan base. Lines at the original park location can get so long during peak lunch hours that the restaurant operator offers a webcam so guests can decide if the queue will be worth it. 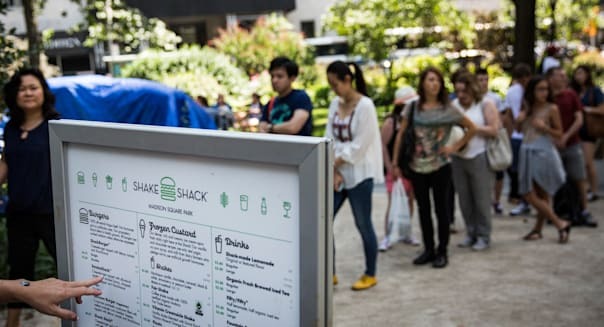 Shake Shack also has two separate lines, allowing those who simply want a shake or a frozen custard to have expedited access to the chilly treats without having to wait in the longer lines of folks hungry for its Angus beef burgers or flat-top hot dogs. One thing for sure is that if Shake Shack is able to pull off its IPO in the coming months, it will draw attention. Most restaurant chains that have gone public in the last year have treated investors to healthy pops at the open on their first day of trading. Sustaining those gains has been the real challenge, and some of last year's market darlings, like pasta boiler Noodles & Co. (NDLS) and sandwich baker Potbelly (PBPB), are trading sharply lower in 2014. The market has been rallying, and it's been particularly kind to consumer-facing companies. However, Noodles & Co. and Potbelly have shed nearly half of their value so far this year. Shake Shack hopes that it will be able to buck the trend and hold on to any initial gains, but it needs to make it that far first. It won't be easy. Even Shake Shake's concretes -- its signature frozen custard treats -- melt under heat despite their sturdy name. Motley Fool contributor Rick Munarriz has no position in any stocks mentioned. The Motley Fool recommends McDonald's. The Motley Fool owns shares of JPMorgan Chase. Try any of our Foolish newsletter services free for 30 days.